Mesmerized by the songs of Peroguarda villagers in southern Portugal’s Alentejo region, young Portuguese modern poet Antonio Reis, Corsican researcher of Portuguese folk music Michel Giacometti, and film director Paulo Rocha visited the village one after another in the late 1950s. This work refreshes the soul and flows with songs and poetry seeped in sadness, as well as the atmosphere of the quiet sea and village, fields adorned with vibrant red flowers, and roads traveled by Reis and the others, while interspersing images from Paulo Rocha’s films. [Director’s Statement] After the completion of my previous film, Polifonias—dedicated to Michel Giacometti, the Corsican savior of the memory of popular Portuguese culture—was born the desire to traverse certain paths that had been pointed out to me: that of the home of António Reis (then still a poet) in Alentejo, in the village of Peroguarda, the very same place in which Michel Giacometti wished to be buried, and others I wished to visit for my own reasons, such as, for example, to approach Paulo Rocha’s film Mudar de Vida, which fascinated me particularly by the interaction between the narrated story and the end of the fishing communities of Furadouro. Little by little it became clear what, beneath the surface, constituted in my mind one of the faces of Encounters: the echo of the past, of a time gone by, of a culture which had died out, but an echo one hears in the present and which resounds in its appeals. It thus became a question not of deploring what has disappeared, not of making a nostalgic return to the past or of bringing fragments of the past into the present, but of letting go of memory to make way for the living. Because of that, the film has a strange relationship with time. Intermingling and telescoping various “historical” times, the chronology loses its importance—the dates no longer really have such a thing. The past no longer occupies the place one traditionally attributes to it. I see the film in the text of Sérgio Godinho, which recurs rhythmically over the course of Encounters: They say that in death one comes from afar to encounter something. We find reincarnation in the recognition of a voice, and some far-off voice brings us that familiar certainty that we have never been alone. For we find familiarity on a park bench where we have never been seated. Because a recollection that fades lives on in our memory. What mystery of memory is this? That of life, which rubs things out, then rewrites what it continues to feel. Born in France in 1950, Pierre-Marie Goulet has lived in Portugal since 1990. 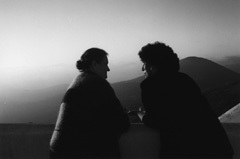 Encounters won the award for Best Sound at the 2006 FID Marseille, and Jury Honorable Mention at Documenta Madrid 07. His other films include Mevlevi (1970), Corps morts (1972), Naissance (1973), Un paysan des Alpes (1973), Ô Gaule (1974), Ici (1975), Balade (1978), Djerrahi (1978), Site (1980), Le chemin de l’architecture (1981), Au Père Lachaise (1986, with Jean-Daniel Pollet), Plage (1987), Faits et dits de Nasreddin (1993) and Polifonias—Paci é Saluta, Michel Giacometti (1997), which was named Best Portuguese Documentary at the Encontros Internacionais de Cinema Documental da Malaposta. He has also written original and adapted screenplays.